iRealHousewives | The 411 On American + International Real Housewives: Joanna Krupa Engaged To Douglas Nunes Just 7 Months After Divorce From Romain Zago! Joanna Krupa Engaged To Douglas Nunes Just 7 Months After Divorce From Romain Zago! Joanna Krupa is engaged to businessman Douglas Nunes. 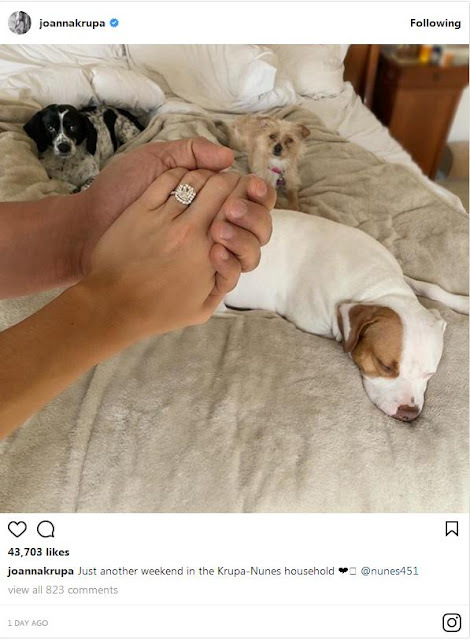 The Real Housewives of Miami alum took to her Instagram on Sunday to post an image of her engagement ring and a trio of dogs. She wrote, "Just another weekend in the Krupa-Nunes household." A rep for Krupa has confirmed the engagement news to E! News. Nunes is the president and partner of property development and entertainment company 451 Media Group. The engagement news comes just eight months after she finalized her divorce from Romain Zago. According to court records, Krupa and Zago finalized their divorce in a Miami courtroom in August 2017, a month after they both filed papers to end their four-year marriage. Lynne Curtin Re-Files For Divorce From Estranged Husband Frank After Nearly 30 Years Of Marriage! Eva Marcille's Ex-Boyfriend Kevin McCall Is Arrested For Domestic Violence! Teresa Giudice's RHONJ Co-Stars Reveal How She Is Coping With Joe Giudice In ICE Custody!